Here is the second of the EVPs recorded during the October 2008 Ghost Hunt with AAPI. Take a good listen. Remember when listening, to listen threw headphones and if possible in a quiet room. You will be able to hear much better. Please let me know what you think by leaving a comment. There are 19 sound clips in all. Some are clearer than others, but all seem to have something there that should not be. Each clip has been prepared by AAPI by doing 4 or 5 separate audio clean-ups. As you listen you will hear the same clip in to 5 different ways. 0.08.00-0.08.10-Oh thats the key to the bathroom. As promised here is the first of the EVPs recorded during the October 2008 Ghost Hunt with AAPI. I just received an email from AAPI (the ghost hunters) who did a program and ghost hunt for the library last October. They had had a bit of computer trouble, but were able to find several good EVPs for us. I will be adding one at a time for you to listen to and review. You will need Media Player on your computer to connect and listen to the sound bites. I hope you will find these interesting and if you find something additional while listening, please let me know. Your comments are most welcome. Electronic voice phenomena, abbreviated as EVPs (singular: electronic voice phenomenon, or EVP), are sections of noise on the radio or electronic recording that reveal sounds resembling voices speaking words. Paranormal investigators sometimes interpret these noises as the voices of ghosts or spirits. Recording EVP has become a technique of those who attempt to contact the souls of dead loved ones or during ghost hunting activities. According to parapsychologist Konstantin Raudive, who popularized the idea, EVP are typically brief, usually the length of a word or short phrase. Skeptics of the paranormal attribute the voice-like aspect of the sounds to apophenia (finding of significance or connections between insignificant or unrelated phenomena), auditory pareidolia (interpreting random sounds into voices in their own language which might otherwise sound like random noise to a foreign speaker), artifacts due to low-quality equipment, and simple hoaxes. Likewise some reported EVP can be attributed to radio interference or other well-documented phenomena. EVPs have been referenced in a wide range of media: reality television series like Paranormal State, Ghost Adventures, Most Haunted, Celebrity Paranormal Project, and Ghost Hunters; fictional television series like Supernatural, Medium, and Ghost Whisperer; and Hollywood films like White Noise and The Sixth Sense. For those of us that believe in ghosts and the paranormal there are few magazines out there. Every week my oldest son and I watch Ghost Hunters on the Sci-Fi Channel. One of their side-projects is the magazine Taps Paramagazine. Starting in October/November 2008 the Sweetwater County Library now has this magazine available for check out. The magazine is a bi-monthly magazine. 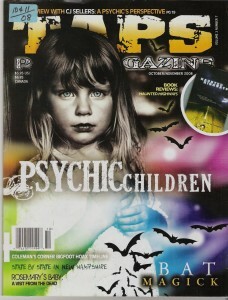 October/November 2008: Bat Magick, Insights into the Afterlife, I Feel Them, Rosemary’s Baby, A Psychic’s Perspective, Coleman’s Corner, The Real Crystal Skull, Paranormal Book Review, Eyes on the Skies, Spirituality Almanac, Sneak Peeks, State by State, TAPS Unplugged, and Evidence Bag. December/January 2009: Teenage Ghost Hunter, No U in UFO, Animal Wisdom-the Goose, the Skinwalker, the Georgia Bigfoot Hoax, Coleman’s Corner, The Wild Man of Shugborough, Rosemary’s Baby, Paranormal Book Review, Paraview, Spirituality Almanac, Sneak Peeks, State by State, TAPS Unplugged, and Evidence Bag. Watch for new issues on our shelves or check to see if your library carries this magazine.